We traded hills for wind this weekend. It was kind of humbling to cycle 100-km hilly routes outside Houston, and then find ourselves so pooped we could barely finish our rides. Even though we’re aiming for 160 km, our odometers have been stuck at 100-km for a while. This weekend, we decided to shun the hills (and the 2-hour commute to get to them) and opt for distance. The wind was a pleasant (or unpleasant), unplanned surprise. A flat tire was also a surprise and likely cost us an hour of cycling time. We pushed through 127 km of city-riding on Saturday. On Sunday, we aimed to add hills to our windy resistance. We did an “urban hill” loop where we tried to climb as many highway overpasses as possible. The wind was relentless. If we thought Saturday was windy, it was even windier on Sunday. Southeast winds of 30km/h with gusts over 50 km/h. Rob rerouted it to include a stopover at Mi Tienda #2, our favourite Mexican grocer. We weren’t going to skip out on our aguas fresca ritual! This week they had mamey, which was a hard choice over the guanabana. Even though we were out and about on our bikes most of the weekend, we actually had more energy. I guess we’re better at tackling wind than hills. We ended up (ok, just me) stockpiling veggies when we finally ended up at an Asian market for our weekly grocery run. 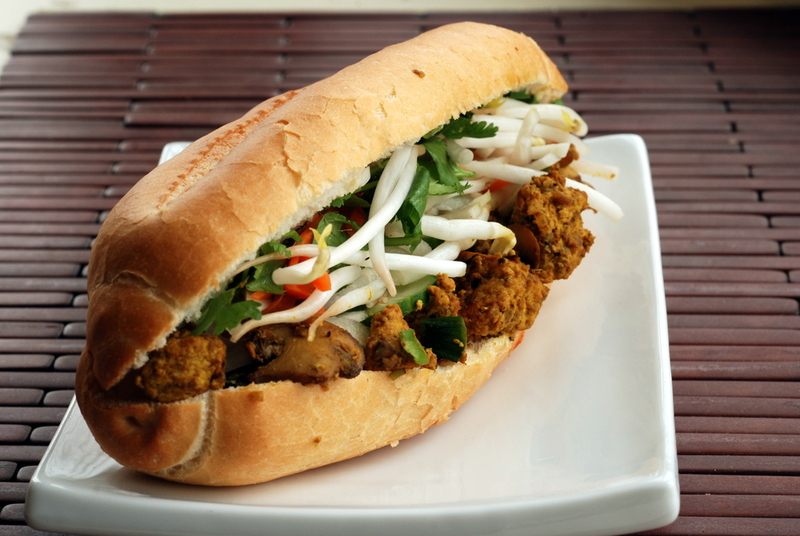 We put them to great use in this vegan spin on bahn mi sandwiches. Banh mi is a Vietnamese sandwich, which I associate with the pickled vegetables and cilantro. Here, tofu and mushrooms are scrambled as the base. The veggies, with Terry’s spin of adding star anise, make this a nice and bright wrap. Rob thought it was his best sandwich ever. I thought it nice, too, and opted to eat it in a collard wrap. Maybe everything tastes better after biking 180 km? 1. Start with your pickled vegetables: After cutting your daikon and carrots, place in a clean, dry 1-quart glass jar. In a small saucepan over medium heat, bring the vinegar, chile flakes, salt, peppercorns, and star anise to a boil. Stir until all dissolves and pour overtop the vegetables in the glass jar. Add additional water to completely submerge. Cover and chill for at least 30 minutes. Keep refrigerated for up to 2 weeks. 2. For the sandwich, in a large non-stick skillet over medium-high heat, heat oil. Add mushrooms and saute until tender, around 4-6 minutes. Remove and set aside. Add the shallots, sprinkle with a touch of salt and saute until browned, around 4 minutes. Add the white parts of the scallions, garlic and cook 2 minutes more. Crumble in the tofu and add the cooked mushrooms back to the pan and stirfry for 2 minutes more. 3. In a small cup, combine the vegetable broth, soy sauce, lime juice, coriander, white pepper and curry powder and pour overtop the tofu. Cook until the liquid has been absorbed and the tofu is golden, around 10 minutes. Stir in the green tops of the green onions and remove from heat. 4. To assemble your sandwich, spread mayonnaise and/or sriracha on the bread (if desired). 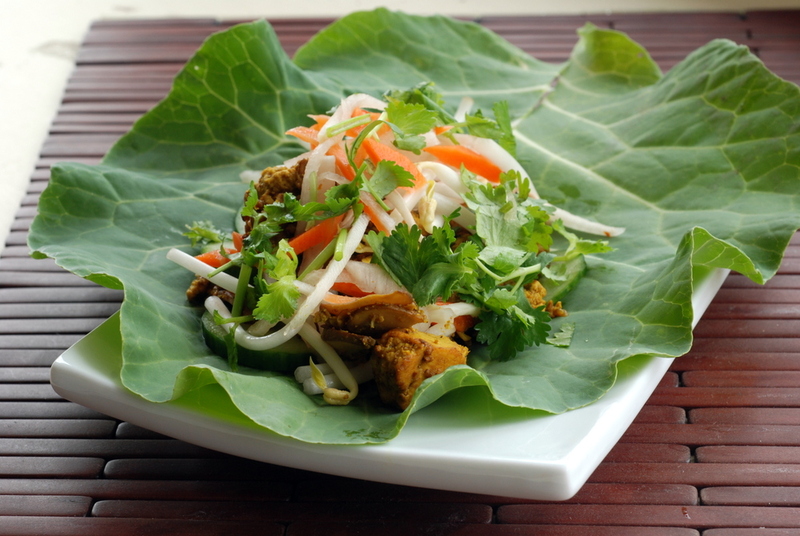 Top with cucumber, tofu, pickled vegetables, cilantro and bean sprouts. This looks wonderful! I’m thinking about incorporating more greens-as-wraps into my life (instead of bread), so I’m glad to see this! This looks really delicious – I love how you prepare the tofu. Wind was the theme of my runs this weekend too, and it’s really putting a ton of pressure on my quads! I love hearing about your biking – it’s inspiring me to do some cross-training on mine when the weather clears up! Word to everything tasting better after a hard workout. Especially that bike ride- yikes you guys are awesome. And yum to those pickled vegetables! I’m so lazy when it comes to that stuff but it must really step up all your meals. Give me some of your motivation please! I have been so super busy I haven’t made any new recipes lately. But things are looking better and this one looks goooood. I like the wrap idea. I have been trying to eat more greens. As a matter of fact, I made some pasta from Nava Atlas’ greens cook book last night. So I am ready to go. I love Vietnamese flavours so this really appeals to me – and it’s different to anything I’ve had before too. This sandwich sounds amazing! Lots of fresh veg and a protein infusion so sound like they’d be especially good after a long bike ride, too. NOM. I choose wind over hills any day! Well, it depends how cold it is. But in general. My stomach is growling looking at this sandwich! Totally understandable why you inhaled it. 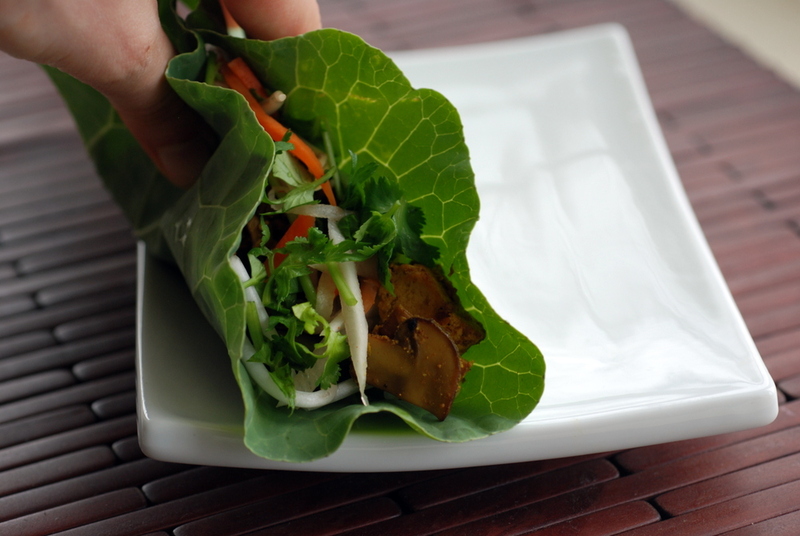 This sounds like a great way to shake a up a collard wrap lunch! This look fabulous, whether wrapped in a bun or collard leaves. 😉 I love the flavor of star anise. 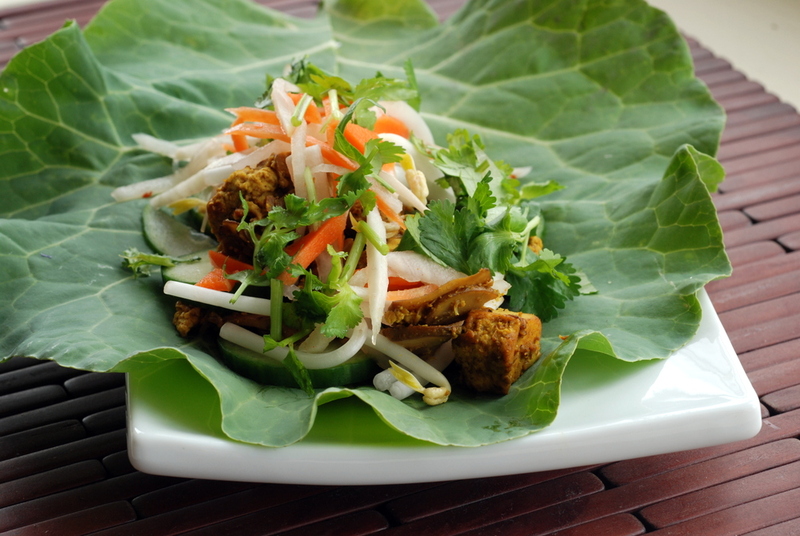 I LOVE Bahn mi – what a fun and healthy take on it! Once when I tried to research collard leaves and to what they would correspond in Germany I only came up with animal food. I think it’s a shame that nobody grows these leaves here. Do you think kohlrabi leaves would make a good substitute? I made this one last night for the two teens and me. Wife was working. So Bill made this and it was enjoyed by the three of us. My son really liked it and he is not as adventuresome. But we all love tofu and this had veggies and the wrap. My son loves green vegetables, which is funny because he could live on cheese pizza. However, as he pushes up to 14, he eats everything. And lots of it. So being the good veggies we are, he is consuming a lot of plant matter. Since he liked this, he inhaled it. I loved it too. The only struggle was the wrap. Son and I loved the taste, but it was messy. We still ate it, the son copiously. Daughter liked it a lot but for her second serving she ate it in a bowl. Next time I will offer the baguette roll option. Daughter has a friend whose family has a French bakery so great baguettes are there to be had. I do a big shopping there every Saturday because I am trying to stay more whole grains. One day a week is good.But the kids were very pleased with this so I am thrilled with the two yes votes.